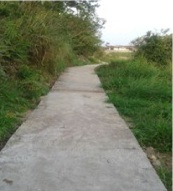 The construction of footpath from Domkynroh to Mawiawan-Mawlorphar road at Urkasniang village, a decent sized hamlet of 68 households and with population of 350 is a blessing to the people of the village as this footpath leads from the village to the main road. The footpath was earlier a kutcha footpath which was very slippery especially in the monsoon season and many people had slipped and got hurt. Now, this footpath has been converted to a C.C. footpath and the people of the village can easily commute to and fro from the village to the main road and vice versa. The length of the C.C. footpath is of approximately 500 meters and the project was sanctioned for Rs. 5.00 Lakhs under S.C.A (BADP) 2016-17. The Hilland village situated at a distance of approximately 3.5 kilometres away from Mawkyrwat the District Head quarters of South West Khasi Hills District is a small and quiet village. The land allotted for the purpose of dumping ground is located on the outskirts of the village. Besides the residents of the villages, the Mawkyrwat Market Waste Management Committee, Mawkyrwat looking after the cleanliness of the Mawkyrwat market is also utilizing this place for dumping of garbage and waste. The members of the Village Committee of Hilland village and the members of M.M.W.M.C, Mawkyrwat approached our office for financial assistance to construct an approach road leading towards the dumping ground which are were able to sanction for Rs. 6,08,250/- during the year 2016-17. With the completion of the works the garbage trucks carrying garbage and waste can now reach right up to the dumping site. Nongnam a remote and inaccessible village is located deep down the steep hill slopes of Mawkyrwat Mountain Range. To reach the village one has to trek for 2-3 hours by walking down the steep and winding footsteps. The people residing in the village are mostly farmers and their main occupation is the cultivation of cash crops like areca nut, betel-leaf, pepper, bay-leaf, broom leaf, citrus fruits etc. Because of the topography of the place, the distance to the nearest road-head, presence of streams and rivers the people of the village are facing a lot of difficulties in their day-to-day livelihood activities. In order, to alleviate some of the hardships faced by these sincere and hard working people of this village, the office was able to sanction construction of footbridge over Umit River. Now with the construction of this foot-bridge the people of the village can easily cross the river to go to their plantations orchards and to the adjoining village especially in the monsoon seasons when the river is swollen with strong currents making it impossible to cross in the absence of a footbridge. The footbridge was sanctioned for Rs. 9.00 Lakhs under SCA (BADP) for 2016-17.